A Good Samaritan rescued an elderly man from a residential fire in Antioch Saturday morning. Marianne Favro reports. 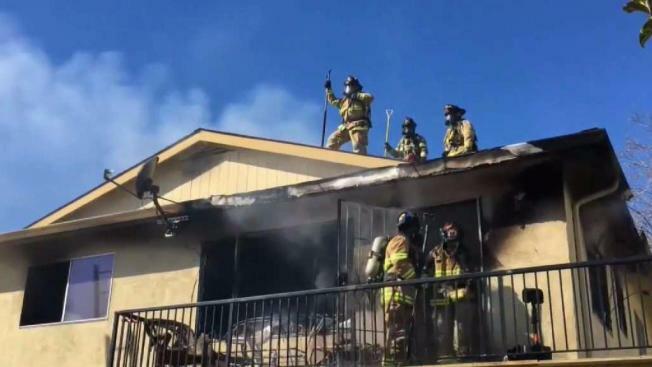 A Good Samaritan rescued an elderly man from a residential fire in Antioch Saturday morning. The fire started at the 2000 block of Peppertree Way after a caretaker put some food on the stove at around 10:48 a.m., officials say. The caretaker was unable to remove the 77-year-old male from his room and fled the two bedroom apartment. Shortly after, Samantha Barnhouse, a neighbor, saw the fire from across the street, went inside, past the flames and dragged the elderly man out the front door. "As soon as we got out that fire roared," said Barnhouse. "It went through the doors, it went through the windows, it just went boom." Antioch police and Contra Costa firefighters responded the structure blaze and were able to extinguish the fire. The elderly resident is now displaced but did not suffer any serious injuries. The man and Barnhouse were transported to the hospital for smoke inhalation.